This is perhaps the hardest part of the whole thing... taking the sketch and converting it into reality. 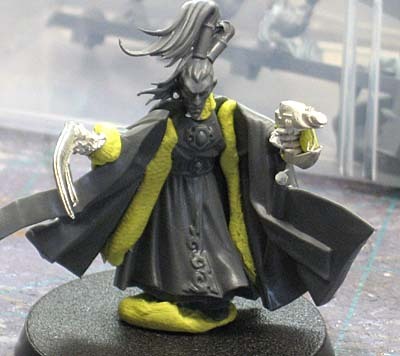 We came up with the idea that I would use the body of a Fantasy Empire Wizard, the specific Dark Elf head my Client wanted and the weapons from an actual Archon model along with a Necron Flayed One hand (for relative scale). After we had the "bits" we were going to use, I had to convert them to become what the sketch looked like. Lots of cleaning away unwanted iconoography and such needed to be done. We also sat down and figured out exactly how all the smaller pieces were going to fit together before any cuts were made or anything was sculpted in place. 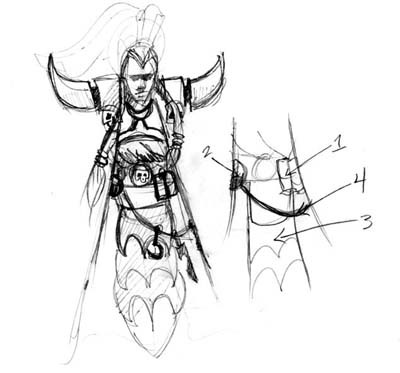 All the little things had to be planned out like the grenade he carries, the small torture weapons on his belt, how his hair will hang, how the shoulder pads will sit on his shoulders, where his drug tubes connect into his armour and even how his armour is going to be sculpted. And then I mocked up the model to get a rough idea of how things were going to look (mind you, the finished model looks completely different). The idea behind doing it this way was to make sure we cut off any potential problems before they became problems. We covered everything in extensive detail and it paid off in the end. We might have sent 20 plus emails back and forth just getting the details ironed out, but once it came time to sit down and start sculpting, we'd already cleared most of the hurdles in front of us and knew what areas we might have problems with. Sounds amazing! Can't wait to see the finished project! Can't wait to see how this guy evolves. Very impressive. Looking forward to seeing more. I'll admit, I'm really excited about this project - can't wait to see how it turns out. Impressive. 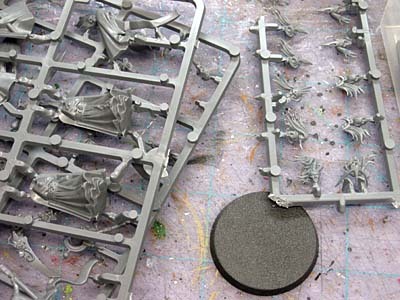 It would be a really nice conversion! This is looking good, I want to see the final model. If you can get it to match that sketch it's gonna look awesome. Thanks guys, the final model matches the skecth fairly well I think, just a bit more dynamic in the pose. I'll have another update on Monday.